Adopted in 1962, the official flag of Kentucky features a state seal design in the center, with the state motto:“United We stand, Divided We Fall” and the image of "two friends embracing" centered on a blue field. The "Commonwealth of Kentucky" appears in gold lettering around the top half of the seal. Show your Kentucky State pride with these 100% made in USA flags that are made to the official design specifications and color scale. Choose from lightweight nylon and heavyweight polyester for your outdoor flag flying needs, choose our nylon indoor flags or the indoor flag kit for your indoor flag presentation needs. Our industrial grade flags enjoy 6 months guarantee on construction and are offered in all popular sizes from 3’ x 5’ to 8’ x 12’ to cater to all your flag flying needs.Shop from our complete line of Kentucky Flags right away and avail the best prices, quick shipping and much more! 100% customer satisfaction guaranteed! Kentucky flags from Tuff Flags are crafted with precision and finesse for the best visual appeal and durability. Expertly printed on 200 Denier nylon with UV resistant Dupont inks, our nylon outdoor flags will retain its beauty for a long time. 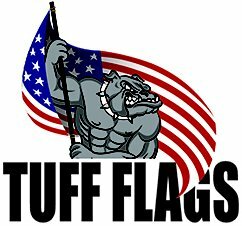 The light weight construction makes it a good choice for low and medium wind conditions while the quick dry features add up to the credentials of nylon flags as outdoor flags. Finished with sturdy polysateen heading and strong brass grommets, these flags will make a spectacular display. The polyesterflags are built with super strong, woven polyester that are designed to withstand heavy winds and hostile weather elements, which makes it a perfect choice for companies and organizations that fly flags on a daily basis. Our indoor flags make impressive additions to your interiors. Choose from plain and fringed models or the oak indoor flag kit if you wish to leave a lasting impression in the minds of your audience. 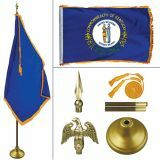 These flag kits come with flags, flagpoles, tassels and ornaments that will create a spectacular display. No matter what your flag presentation needs are we can offer the best models at the most competitive rates. 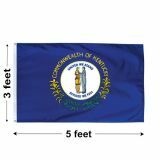 Browse our selection of Kentucky flags to pick up a model of your choice. 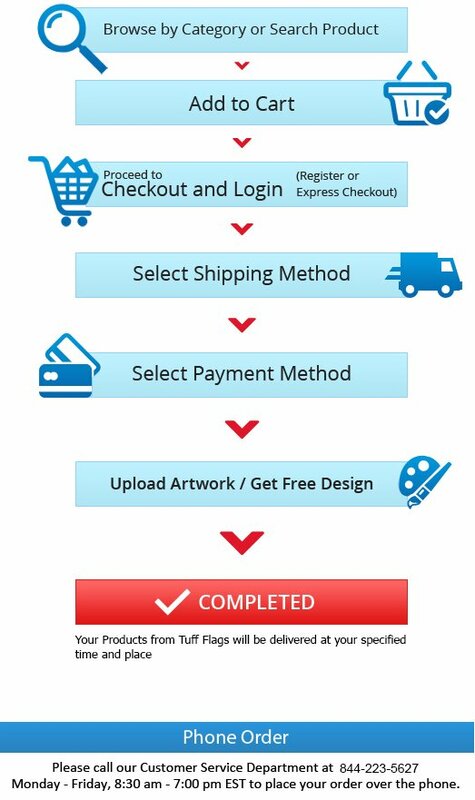 Should you need any tips call us at our toll free number (888) 287-3524 or email us at customercare@tuffflags.com.